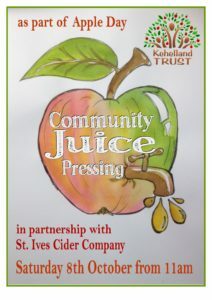 We are delighted to be working in partnership with St. Ives Cider Company to offer a Community Juice Pressing Service on our Apple Day on 8th October. Apples can be hand-picked or recent windfalls, but need to be eaters or cookers have less than 25% bruising or marking and be free of wildlife! All donors to the press will be given a voucher that allows them to buy back a quantity (to the value of their harvest) of the juice at cost. It will be processed, bottled and pasteurised. So if you have a harvest so big you can’t eat or cook all of it, or know of others in your community that cannot manage their own, why not consider having it all juiced by St. Ives Cider and preserved until next year, when we could do it all again?! If you have a cider apple tree, we will be doing a cider press, but it is absolutely essential that you tell us (!) if you are supplying cider apples and they will be processed seperately. We will be told which batch of cider they have become a part of, so you can look out for it on the shelves later on. 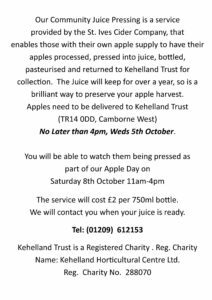 ALL APPLES FOR THE PRESS MUST BE WITH US NO LATER THAN 4pm on WEDNESDAY 5th OCTOBER.